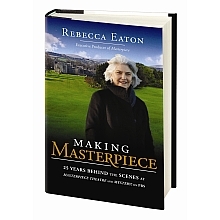 Fans of Downton Abbey will appreciate the new memoir Making Masterpiece: 25 Years Behind the Scenes at Masterpiece Theatre and Mystery! by Rebecca Eaton, Executive Producer of Masterpiece and Mystery! on PBS. In this informative book, the author shares insightful memories of her 25 years in public broadcasting. Much like the award-winning programs she has produced, she invites the reader into her living room, thereby increasing their knowledge of behind the scene workings at PBS. As a fan of PBS, I enjoyed this book. Anecdotes contained in the memoir about various television and movies stars who have appeared on the programs were priceless. Much like the period programs and mystery series, the book opened a whole new world to me! Please continue to support public broadcasting! This entry was posted in Uncategorized and tagged Allistair Cooke, Downton Abbey, England, Making Masterpiece, Masterpiece, Mystery, PBS, public television, Rebecca Eaton, Vincent Price. Bookmark the permalink.